EDIT: Giveaway is officially closed. Congratulations to the randomly chosen 78th commenter, Ľubaša! One lady will get to adorn herself with a one of a kind jewelry piece fit for an ice queen from a snowy wonderland. 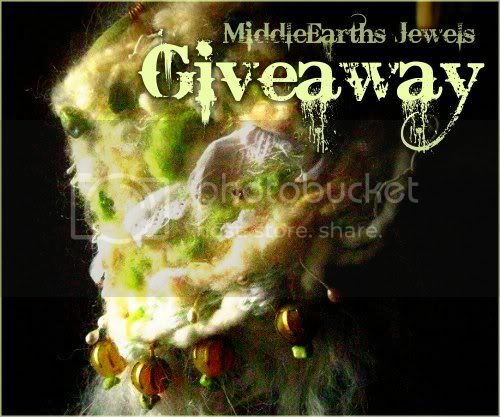 MaryAnne of MiddleEarths Jewels is giving away the wonderful Winter Garden cuff above. She hand wove, then hand felted bits of vintage lace and fabulous designer wool yarns. Chinese matte jade balls in honey and amber with vintage caps are strung with golden silk cord around the bottom, earthy green stone chips are sewn around the top. Buried deep in the soft wool are tiny swarovski crystals in topaz and peridot green that sparkle discreetly. Vintage glass leaves in chestnut and soft greens dangle and clink under the dusty green leather lace that finishes the outer edge. The soft mohair fur goatskin trim adds the final bit of magic luxury. I am honored that she dreamed this wrist cuff into existence specifically to be a giveaway prize on my humble blog. She even shared her creative process on how it was magically crafted. MaryAnne is such an amazing jewelry artist! Nothing I could write would describe her fantasy accessories purely enough - the creations must be seen for themselves. Giveaway is open worldwide. I will be pulling a number from my random.org top hat after 11:59pm EST on December 11, 2011, and the corresponding commenter will win! MaryAnne will contact that lucky soul for a mailing address. If she doesn't hear back from the winner within 3 days, a new number will be drawn. 1. Like that same item by using the facebook like button on the right sidebar of MaryAnne's Etsy listing and leave a comment here with the number of likes to the right of the button OR share it on your business page and include the link when commenting. 5. 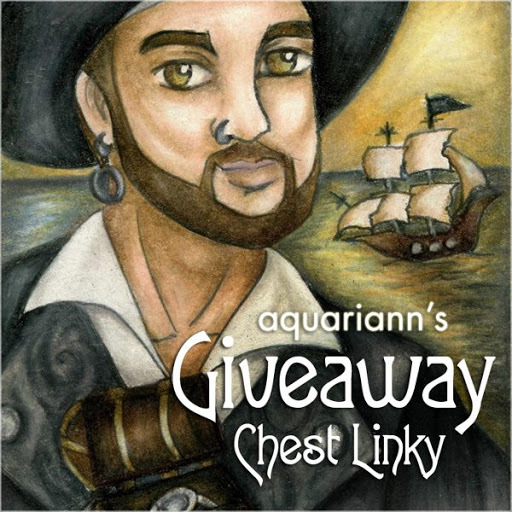 Like the MiddleEarths Jewels AND aquariann Art pages on facebook for one extra entry. 6. Follow @MiddleEarthsme and @aquariann on twitter. Following us both counts for two entries, as long as you leave a separate comment for each with your own username. 8. 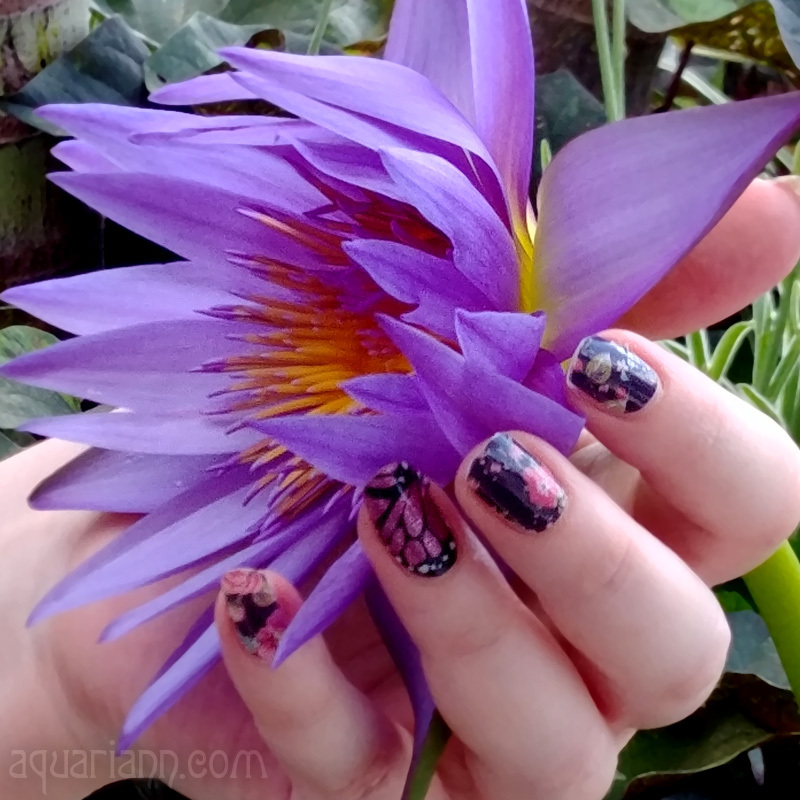 Follow the MiddleEarths Jewels blog AND my blog on Google Friend Connect, Networked Blogs or your favorite RSS reader for one extra entry. My favorite item is Lava Luxe earring. How pretty! OH MY ... what a beautiful collection ... thanks for highlighting MaryAnne's work. I have given Azorica earrings a facebook like- I was the first. I love the Azorica necklace! Just beautiful! I love the Azorica necklace! shared the item on facebook, my facebook name is madalina bibi. I love the wrist cuff fabric bracelet The ButtercupVelvet Garden. Love the colors! I love the teal twilight raven collage pendant! I love the RoseWood pendant necklace O_o gooorgeous! I am in awe at both the process and the finished piece. And Google friend connect is a given. I'd love to see what else you both get up to. Thanks for such a wonderful giveaway and the opportunity to become aware of yet another creative soul, making beautiful things in this world. I love the Deep Dark Woods shawl. Loving the gothic glam ring. I'm thinking the Nautilis Regalis pendant patina sea creature steampunk assemblage necklace is awesome! My favorite is the doorstep image pendant, such a haunting design and the color is gorgeous! I added the doorstep image pendant to my favorites and hearted her shop as sandyandcosmo. I follow both blogs through gfc as sandyandcosmo. I love the By The Sea shawl handwoven linen cotton wrap! I love the concept and colors of Mary Anne's Rosewood pendant; simply stunning! Wow, I was the 7th person to "love" the Rosewood pendant; I need to seriously sell some stuff so I can buy it! I picket fenced your blog today! I bloggety blogged and used your button; busy day today! Thanks for the chance to win! I love the Azorica necklace.